Bridge Heights: This is a very popular topic and it doesn’t seem to be posted anywhere else, so I’m including it here. Bridge heights vary from about 8 to 11.25 feet. The listed heights are described as the bridge heights ‘at high maximum water level’ so you can have a bit more clearance than the numbers indicate. The map links a bit lower on this page will go over each of them. Please note a common misconception here is that one will not be able to fit a decent size boat through the bridges. This is often incorrect. Of course if you are talking about a 40 foot vessel with a flying bridge, that will not be possible behind a 10 foot bridge. But 26+/- footers, boats with center consoles, with t-tops, certain cabin cruisers, and many others are routinely found behind the bridges. You may have to drop radar antennas, or bring down the fishing poles momentarily, but consider that many of the best neighborhoods are behind the bridges, as they were left undeveloped until recent years. Also, the majority of the widest canals (in the SW corner) are all behind bridges. By comparison you will pay significant sums for the wide, sailboat access canals, so keep your options open as much as possible when looking for deals! Another item to note is that boat size needed is often overestimated by buyers not familiar with the area waters. This is nothing like the East Coast of Florida where the seas are rougher and a bigger vessel is needed! The Gulf of Mexico is usually very calm, and there are many miles of back bays, rivers, etc. Another benefit of the smaller boats is that you can pull up very close to the shore at most all area beaches, whereas a larger vessel would inhibit your ability to do so. The most popular fishing boats seem to be 24-26 foot Grady Whites, Robalos, or similar. For cruising, a 22-26 foot Bayliner or Hurricane deck boat are frequent choices. 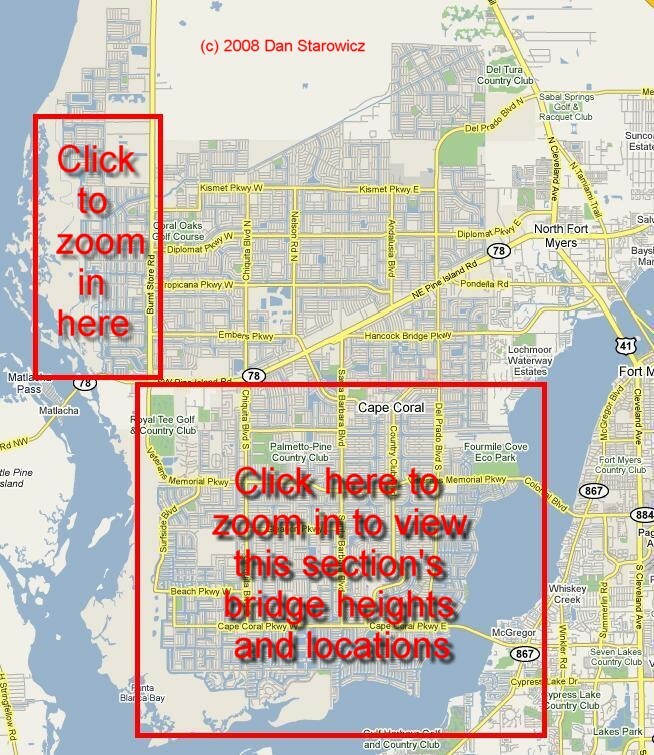 Below I have included the most detailed Cape Coral map collection on the internet. The only thing better is a printed map I have available as a courtesy for my clients. You can certainly schedule stopping by to pick up a copy if you are in the area, or give me a call at 239-603-6100 to have one mailed to you in advance of a trip down here. Click on a section of interest below and a larger version will appear in a pop-up window. Please note 1) the legend (key) on each pop-up map and 2) That the boat lock in the SW section located adjacent to Four-mile Cove Eco Park has recently been removed and no longer applies!